For the dressing: Mix all ingredients in a small bowl. For the salad: Open can of peaches, drain and save the juice. 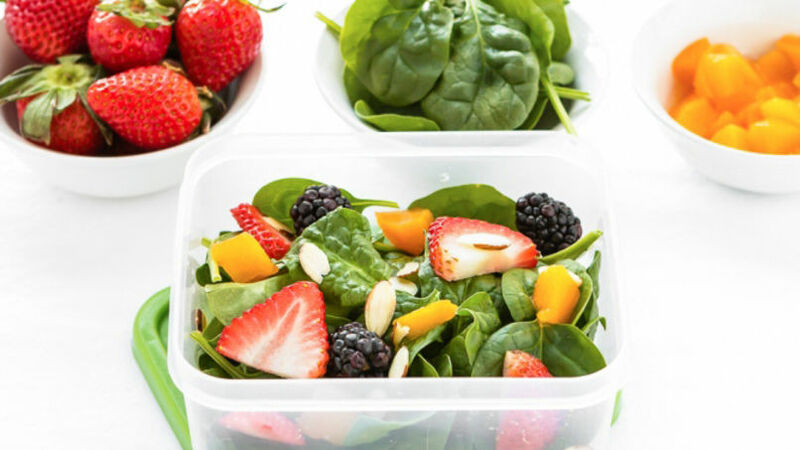 In a small container, place peaches, spinach, strawberries and blackberries. Mix well. Divide salad into 2 containers that can be use in lunch bag. Sprinkle with almonds. Cover with lid and place in kids' lunch bags. You can add the dressing to a small container so the kids can add it to the salad when they're ready to eat. You can use baby spinach. How hard is it to get your kids to eat salad? It used to be really hard for me, almost impossible. Then, I thought of making a salad with their favorite foods. I also gave up on those oily and creamy dressings and decided to use the natural fruit's juices instead. You can change up the salad to incorporate your kids' favorite foods. Try it and let us know how it goes.